sister of Gold, which is Silver. Both precious metals have logged sizzling 80%+ gains, year to date. Palladium related mining stock North American Palladium Ltd (AMEX:PAL) has done even better than the little brother of Platinum, with a year to date gain of 90%. As incredible as both the metal Palladium and the Canadian based miner PAL have performed in 2010, I think their run towards the sky is far from over. 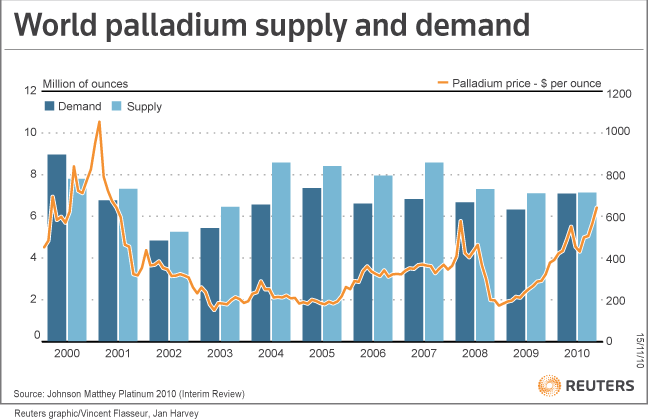 Let’s begin our examination with a chart of the world supply and demand for Palladium. This data, released literally a couple weeks ago, shows that for the first year of this decade, 2010 supply and demand for Palladium were in balance. We also note that for the first year in 10 years, supply was not greater than demand. One of the obvious precursors of significant price appreciation is a shortage of supply, and this development appears to be in the pipeline at this time. For starters, the enormous overhang of a multi-decade surplus of Palladium in Russia is now thought to be virtually exhausted. 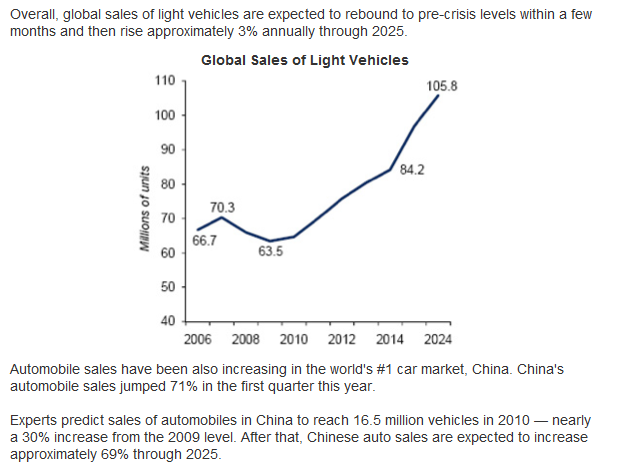 Secondly, as the primary demand for the metal is related to its use in the exhaust systems of vehicles (catalytic converter), the demand shortage scenario now appears inevitable with the projection of increased car production not only in the United States, but also China and India. And finally, the demand side of the equation is being aggressively stretched by investment demand, ETFs, coins and jewelry primarily, as the precious metals secular bull market enters its 10th year. As a matter of fact, on November 30th the US Senate unanimously approved the coinage of a $25 face value Palladium bullion coin with a Mercury-head design and a weight of 1 ounce. And just the past week a new ETF launched that is backed by physical metal and weighted 55 percent in Silver, 33 percent in Platinum and 12 percent in Palladium. This ETF, issued by ETF Securities Ltd. of New York, trades with the ticker symbol (NYSE:WITE) on the NYSE Arca exchange. Investors are increasingly seeking tangible investments that will hedge themselves from the present and increasing ravages of both inflation and the concurrent debasement of their currency. Without a doubt, the creation of new investment vehicles for the investment community will continue to bring in new investment dollars to the precious metal sector, but also effectively take a noticeable chunk of Palladium supply off the market. This is to say that Palladium that could have been used to make car mufflers, jewelry, dentistry alloys and a host of corrosive resistance applications, will either be sitting in a bank vault in Zurich to back up a new ETF fund or in someone’s coin collection. The history of Palladium’s price is interesting. Palladium was valued at $35 an ounce, along with Gold, from 1930 to 1961. Its price then slowly gravitated higher until it spiked to $150 in 1974 (Gold simultaneously spiked to $200), after which it resettled in the $60 range. But Palladium did not stay there long and as Gold made its early 1980 peak of $850, Palladium spiked even higher than previously, to $275. Following a return to the $60 range in 1982, Palladium was range bound between $100 and $150 until 1997. Beginning in 1997, Palladium began a sharp ascent from $100, reaching $400 by January of 2000. During the year 2000, Palladium virtually went parabolic, appreciating nearly 200% in a single year from $400 to well past $1,000 an ounce. During this same time frame (1997 – 2001), gold was basically asleep, rarely succeeding to even surpass $300 an ounce. 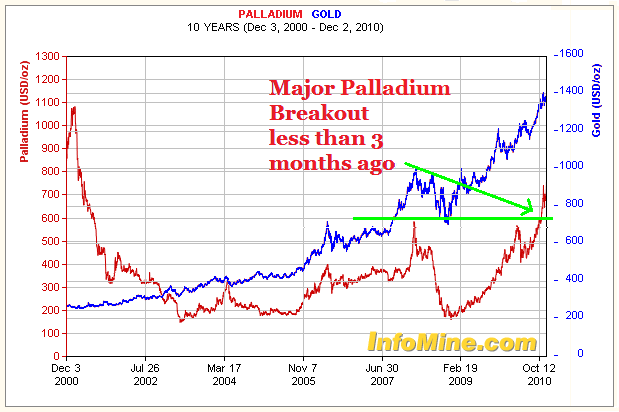 The following chart yields a closer look at the more recent price history of Palladium. Additionally, I have superimposed the concurrent price performance of Gold (blue) onto this 10 year chart of Palladium (red) for relative comparison. Palladium’s highest price of $1,090 was achieved in January of 2001. This occurred, in large part, due to a threat Russia made to refuse selling its reserve stockpiles in the forthcoming calendar year of 2001. The Ford Motor Company contributed to the metal’s panic due to this threatened potential shortage in supply, by hoarding Palladium for fear of not having enough Palladium for their car manufacturing usage with catalytic converters. It turns out that the Russians subsequently and ‘magnanimously’ decided to make their excess Palladium available for sale in 2001 (once they had scared the market price up from an anemic $100 to over $1,000). But then Ford was holding a bag that was filled with rapidly depreciating Palladium, as the Russian decision to provide more supply caused price to plummet. So Ford decided to unload its excess bounty, further driving the price of Palladium all the way down to $150 per ounce by early 2003. Palladium’s high of March 2008 at $600 (coinciding with a spectacular C wave parabolic in both Gold and Silver) was unsuccessfully matched by the April rally earlier this year. However, the price action of the past three months has successfully taken out that previous landmark. The chart above shows that this important and major break out point ($600) occurred just a few months ago. It would appear, speaking as a technician that Palladium will now continue to rise until it reaches the 2001 all time high of $1,090. That feat, in itself, will amount to a 45% rise in Palladium price from current levels. Judging by the trajectory of Palladium’s parabolic move in progress, which is now uninhibited by further price resistance levels, I cannot imagine it will be long before price arrives at a new all time high. That Palladium will appreciate another 45%, considering the current environment of currency debasement and inflationary pressures, is a given in my mind. What is interesting to ponder, however, is the miner North American Palladium Ltd. (AMEX:PAL) as an investment alternative to simply buying the ETF Physical Palladium Shares (NYSE:PALL) or the ‘soon to be minted’ bullion coin. So let’s now examine a 10 year chart of the only significant pure Palladium miner outside of either Russia or South Africa, North American Palladium Ltd. (PAL). First off, we know that the price of Palladium is now higher than at any time since January 2001. 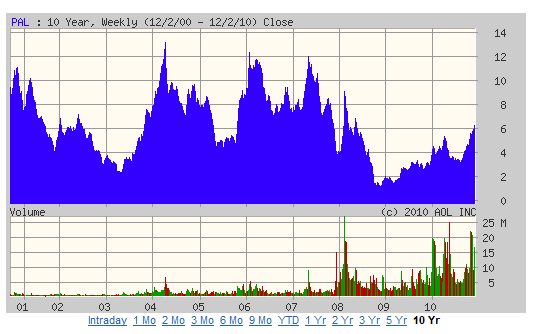 But curiously, the stock price of PAL is not anywhere near as high today as the numerous $12 peaks in the past decade. In fact, it is barely more than half that price at last week’s close of $6.34. This observation alone tells me that a price of $12, while roughly a rise of 100% from current levels and commiserate with previous highs, is still not even close to a fair PAL price level, as the underlying Palladium metal is trading at 9 year highs – higher than at any time PAL has previously traded at $12. I have calculated that the average price relationship between spot Palladium price and PAL stock price for most of the past decade was about 50:1. For example, a stock price of $5 for PAL would roughly equate to a spot Palladium price 50 times greater, or $250. At today’s spot price of around $780, PAL should be trading at $15-16. 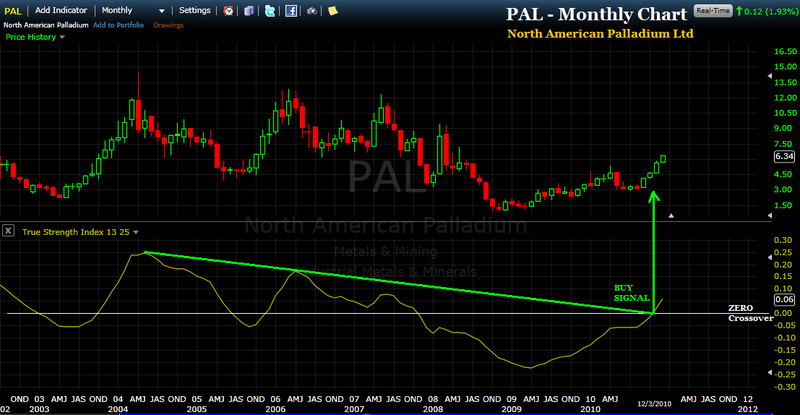 But honestly, North American Palladium Ltd (PAL) has not had a single profitable year in the past 5 years, at least. And yet the stock traded up to $10 and $12 on several occasions within this timeframe. Now guess what? This past quarter analysts expected the company to lose 3 cents a share. Instead, PAL blew out those estimates with a positive performance of 2 cents a share. Analysts are now expecting PAL to earn between 30 and 46 cents per share for 2011E. As PAL share price has a history of reaching $12 with negative earnings, imagine what the share price will be when the company starts logging in a string of explosively profitable quarters. My hunch is that when Palladium retests its historic high of $1,090, as I believe it will sometime later this spring, PAL should trade at something in the neighborhood of $22. That would be an appreciation of nearly 200% from the current level of $7 per share. And this return would certainly annihilate the 45% anticipated return of simply buying some Palladium coins or the palladium ETF PALL. I have listened to the CEO’s 20 minute December 2nd presentation at the Scotia Capital Mining Conference in Toronto, Canada. The webcast and accompanying slide presentation are available on the Company’s website at www.nap.com. If you have 20 minutes and are interested in doing some due diligence of your own, I highly recommend you give his presentation a listen. If we take a look at the monthly price chart of PAL and use the True Strength Index (TSI) momentum indicator to assess its prospects for price appreciation, one observes that this stock could very well be in the early innings of a major price move from current levels. Generally speaking, when the True Strength Index (TSI) indicator is rising above the ZERO Crossover line, price is always rising. Also, when there has been a trend line break of the indicator, as I have drawn using a green line, it signals a significant and extremely reliable BUY opportunity. My disclosure it that I own some shares of North American Palladium Ltd. (PAL), but not nearly as many as I will after this weekend. Best wishes for your trading and investment success.